The West Africa programme of GWI is implemented by IIED together with the International Union for the Conservation of Nature (IUCN) in five focus countries: Burkina Faso, Guinea, Mali, Niger, and Senegal. Our focus is on agriculture linked to large-scale rice irrigation schemes and dams, and we work closely with governments, donors, farmers, river basin organisations, NGOs and research communities. We work at the local and national levels, and at the regional (e.g. with the Economic Community of West African States and the Permanent Interstates Committee for Drought Control in the Sahel) and international levels. We want to develop awareness and debate about the livelihood impacts and economic viability of intensive, large-scale irrigation schemes. This has particular relevance to how food security is being addressed in a variable climate. We want to increase support to smallholder rice farmers in existing large-scale irrigation schemes to improve agricultural practice and productivity sustainably. This includes the sharing and adopting of innovative practices. We want to improve the governance systems around current and future dam-fed irrigation systems. This would ensure that water, land, and economic benefits are shared equitably and conflicts are reduced. GWI West Africa has produced a series of animations outlining ways to improve dam planning and implementation. The animations are available in English and French with English/French subtitles. The first animation explains how policymakers can work with local communities to protect the rights of people affected by large dams in West Africa.' Securing the land rights of people affected by dams in West Africa' sets out how new policies and governance tools, including compensation and new forms of land tenure, can be used to secure the rights of displaced people. The second animation, entitled 'Negotiating fair agreements between government and communities affected by dams', explains how formal agreements can be used to put arrangements in writing before construction begins. Clear agreements give local people a stake in the project and ensure that plans for benefit sharing and compensation are recorded. Most importantly, they reduce the risk of social conflict as resettled people re-establish their lives. The third animation, 'Sharing the revenue from large dams to support local development', explains how local development funds can provide long-term financing to communities who lose their livelihoods when the construction of dams forces them from their land. When they are well designed, these funds can be particularly effective because they allow local people to control how the money is used. 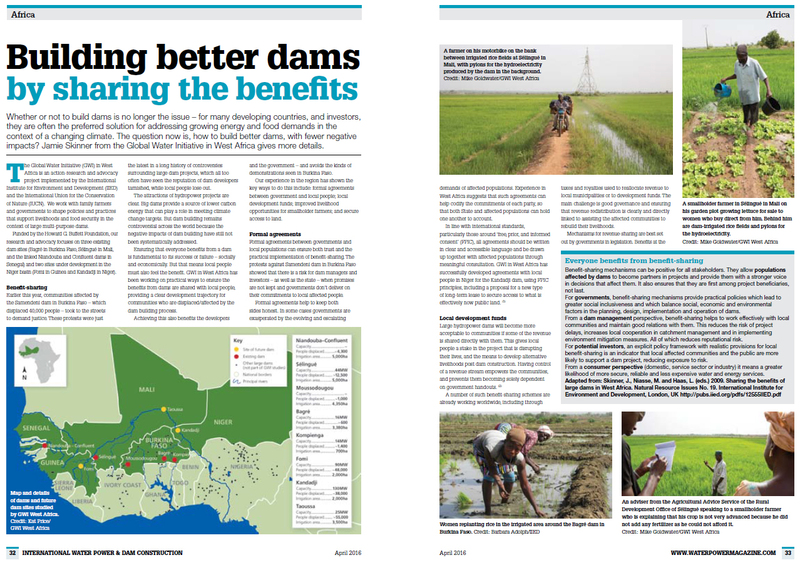 The work of GWI West Africa was featured in the April 2016 edition of International Water Power and Dam Construction magazine, in an article entitled 'Building better dams by sharing the benefits. You can read the full article or click on the images below to expand the four-page feature. Our current work on 'water for agriculture' began in 2012 as part of the strategy of the GWI programme at a global level and will continue until 2017. A previous phase of GWI (from 2008-12) focused on integrated water resource management (IWRM) and access to clean water, sanitation, and hygiene (WASH). 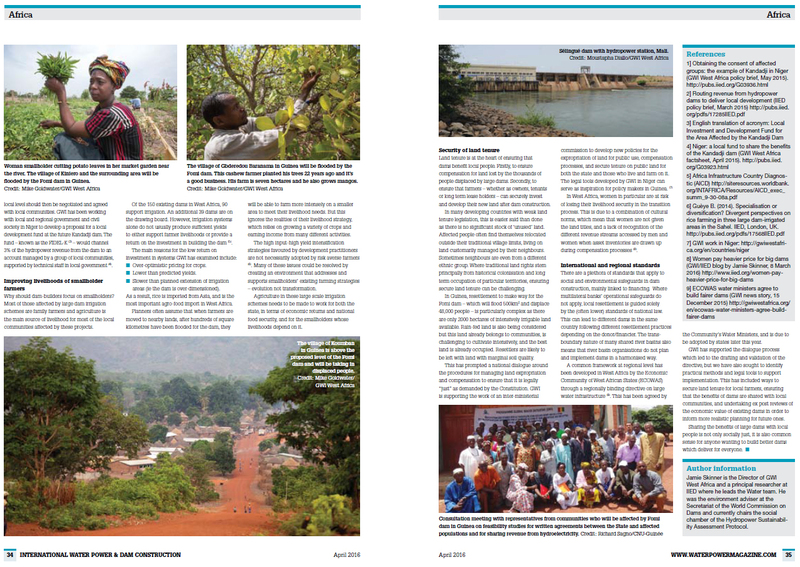 Our work on IWRM during this phase included research and advocacy on benefit-sharing from large dams in the GWI West Africa focus countries and this remains a key area in our current work on water and agriculture. We also continue to monitor the work that was done between 2008-12, and all of the resources from this first phase remain available in the resources library of the GWI West Africa website.